Today’s lesson in eccentric turn-ons has been brought to you by Suicide Squad #67 (March 2010) by John Ostrander, Gail Simone, and Jim Calafiore. …you have to do it yourself. And this concludes our lesson for today. Any questions? 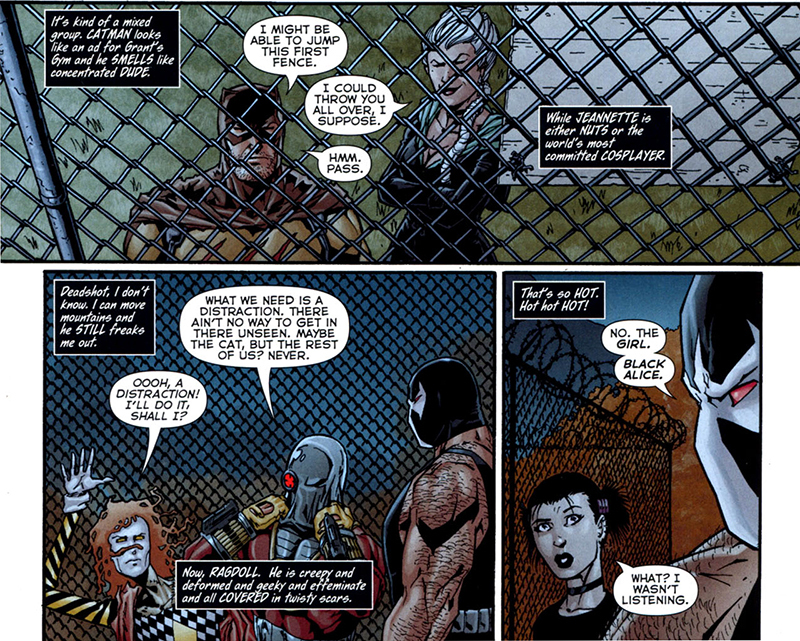 This step-by-step guide has been brought to you by Secret Six #1 (November 2008) by Gail Simone, Nicola Scott, and Doug Hazlewood. There’s a good reason why Deadshot isn’t a professional litigator. A very good reason. I'd like to see what he considers a misdemeanor. Today’s legal counsel courtesy of Birds of Prey #107 (August 2007) by Gail Simone, Nicola Scott, and Doug Hazlewood. Not to be confused with the Demon Trigonadotropin. This devilish little pun courtesy of Secret Six #21 (July 2010) by Gail Simone and Jim Calafiore.